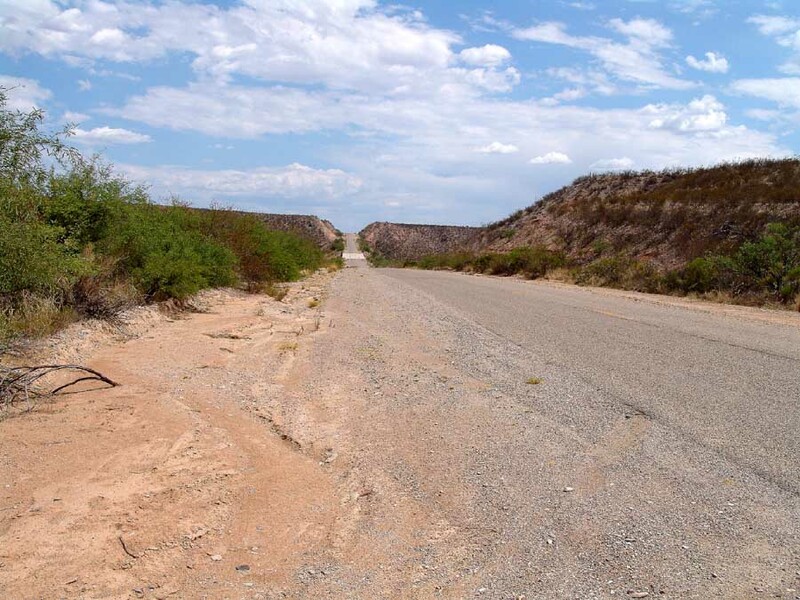 A number of us living in Cascabel for some years had failed entirely to notice the existence of this old side road, the Jimmy-Durante right-facing profile on the map at left which was obviously the old Cascabel Road prior to construction of the Grand Roadway segment in the late 1970s. While the map lists it as a solid line nearly as visible as its high-tech replacement, this very little-used road is nearly invisible at ground level, though still passable once entered (by 4-WD only!). 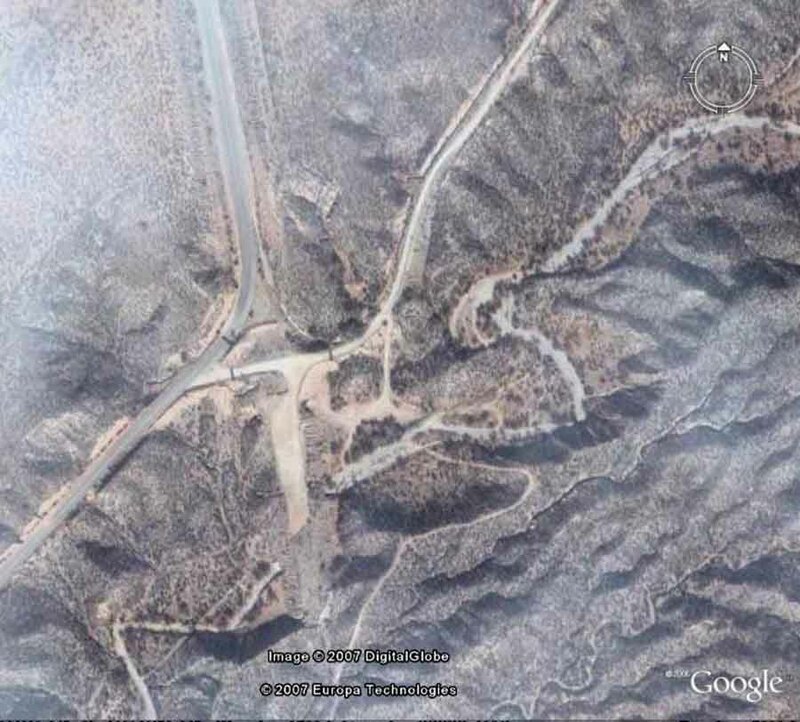 Below, a Google Earth aerial photograph shows the old road in white (marking its gravel surface), leaving the Grand Cut at the top of the lower-left quadrant of the image and running northeastward along the edge of the high terrace to top middle-right. 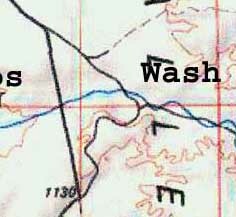 The southern extension of the Grand Roadway also shows clearly here, where it ends toward the bottom, at a precipice over the first of many northeast-to-southwest wash cuts that it would have had to negotiate further south had this 1970s mega-venture been completed. 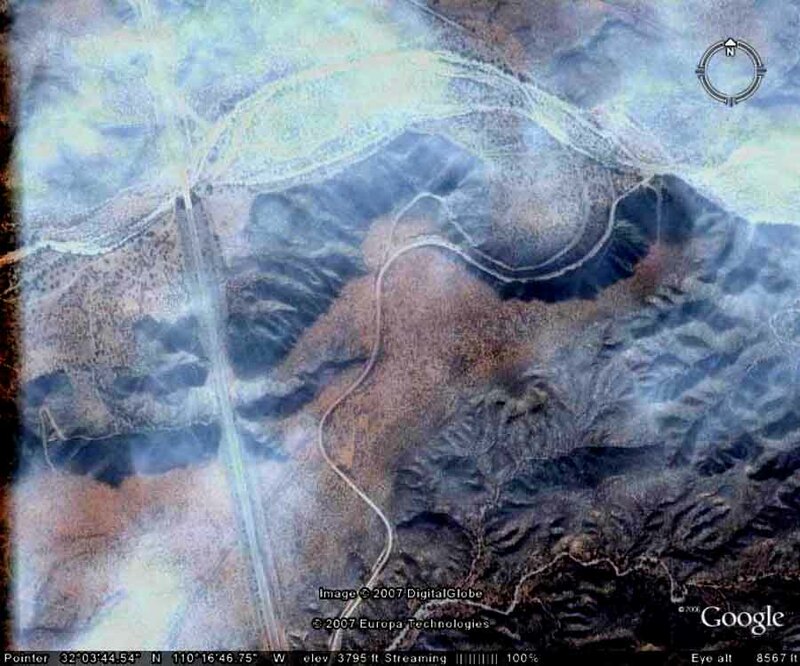 Below (and here we had to greatly increase visual contrast and lower brightness to penetrate the aerial fog of this Google Earth image), you can see the old roadway snaking northward (up), riding the brown-colored terrace above the Tres Alamos Wash at mid-image, then circling down into it (the dark zone), around within the wash (following two distinctive road-paths). The fainter, nearly circular path is the old (1940s?) 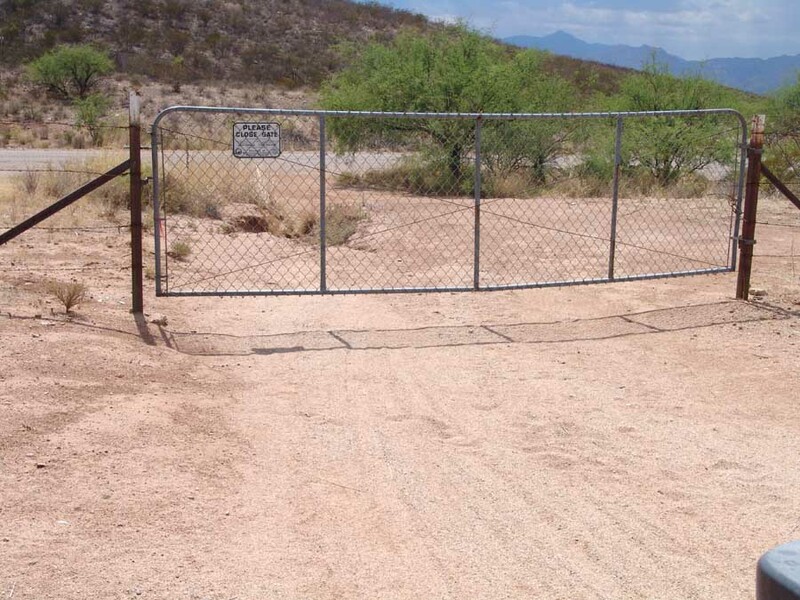 road, which crosses the wash, then climbs back up the farther terrace (where it will meet the Grand Roadway at its northmost tip, remaining a nearly-invisible gated evidence of road-times past). Explored on the ground, we must take the wider, lower, more distinct semicircle, because the inner one is now impassable (washed out into precipices where it drops down the terrace edge). So we take the more-traveled road, which forks on its right-hand side, one portion leading upstream, the other going down the wash where it rejoins the old road to rise out of the wash on to the left-bank (northern) first terrace. 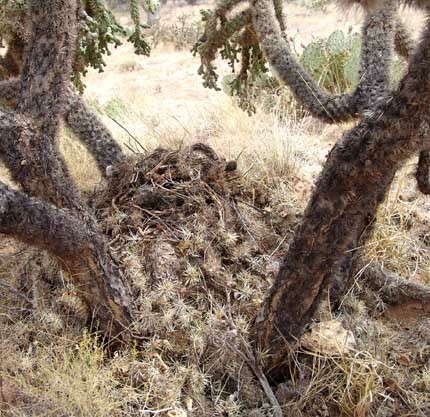 These Cholla trees form dense tangles, a very inner-protective architecture, and are highly prolific of new buds which continually fall to the ground, creating small piles at the feet of the beast. 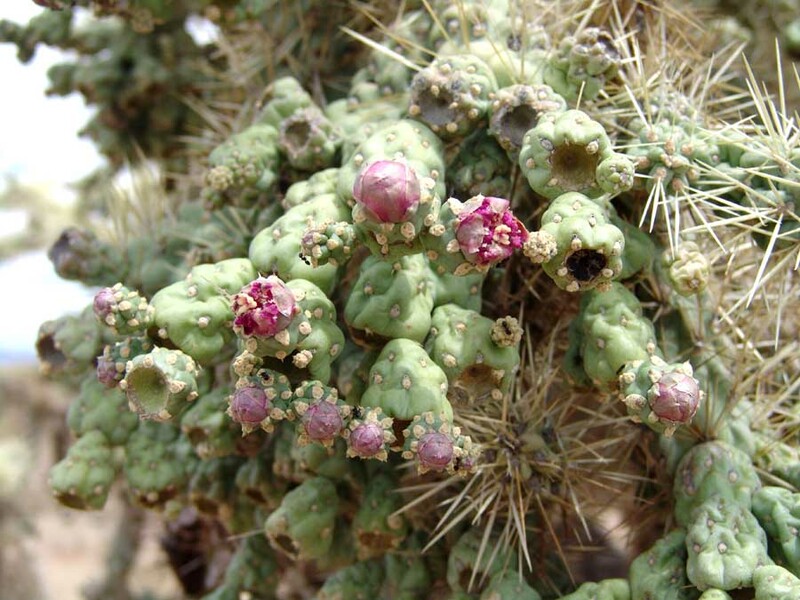 Click on the image for a close-up of the buds, just beginning to bloom. 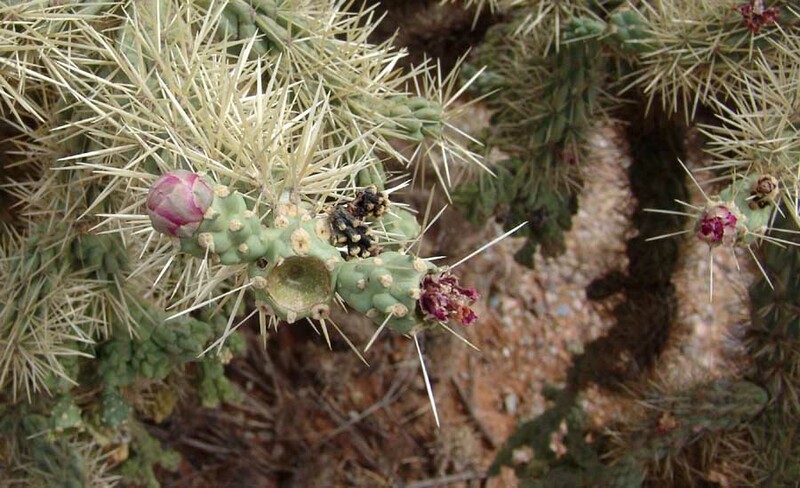 The buds tend to form dense clusters or "chains" over time, hence the name "Hanging-chain Cholla". 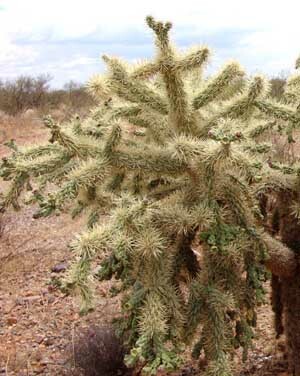 These trees are sometimes mistaken for the "Teddy Bear Cholla", an even more fuzzy-appearing cactus which however grows at lower altitudes. 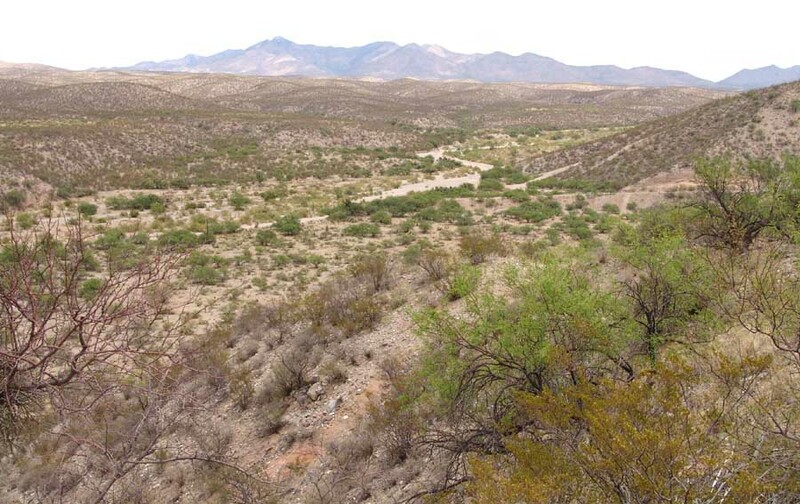 Below, a view off the northeastern edge of the high terrace, looking up Tres Alamos Wash, which runs down from the Winchester Mountains (draining the southeastern portion of the Allen Flats). 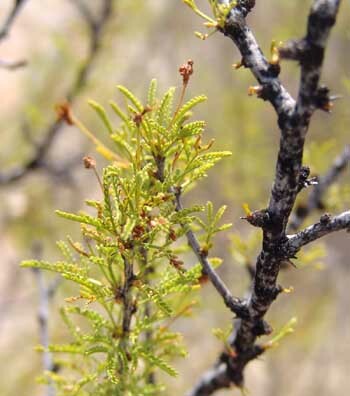 Note in lower-right foreground the color contrast between the coppery-colored creosotebush and the much greener mesquite tree. 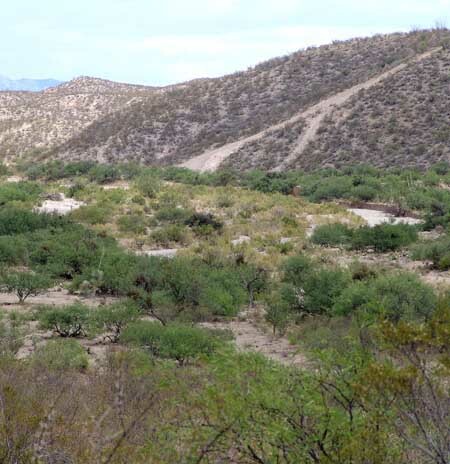 When it is very dry creosotebush registers this kind of sharp contrast to adjacent vegetation. This wash is definitely four-wheel-drive-only. The deep sand of this delta-like configuration necessitates strong acceleration at some points, steering-wheel twisting etc, and of course a high-centered vehicle. 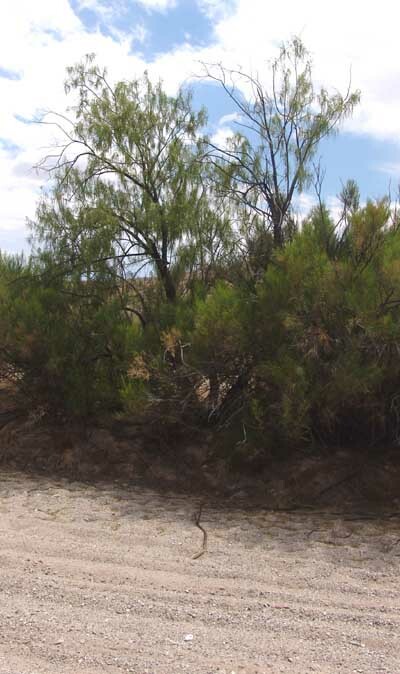 But the deep sand also stores water, since we do see some riparian trees in the wash here, as the Desert Willow shown here at left. Quite a few birds, of considerable variety, were seen flying from tree to tree along the wash.
We did not see any scurrying mammals or lizards along the way on this occasion, but this was midday, heat-of-day photography (around 2 pm). 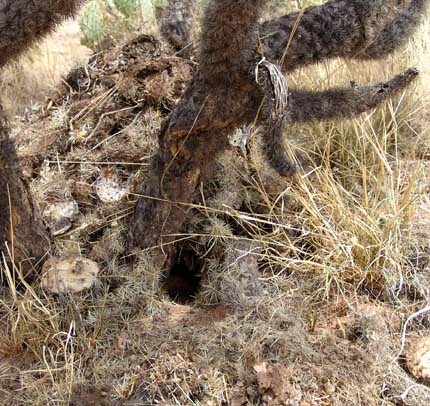 The soft soil provides plenty of burrowing ground, and there were numerous holes. Up on the second terrace on the north side of the wash, we encountered Whitethorn Acacia in fresh bloom. This was a surprise, since Whitethorns replace their leaves only after substantial summer rains. We had felt what we thought were the first drops of summer rainfall in the area as we drove out from Benson on this day (July 07, 2007), but clearly a considerable rain had already fallen upon this terrace some days earlier. 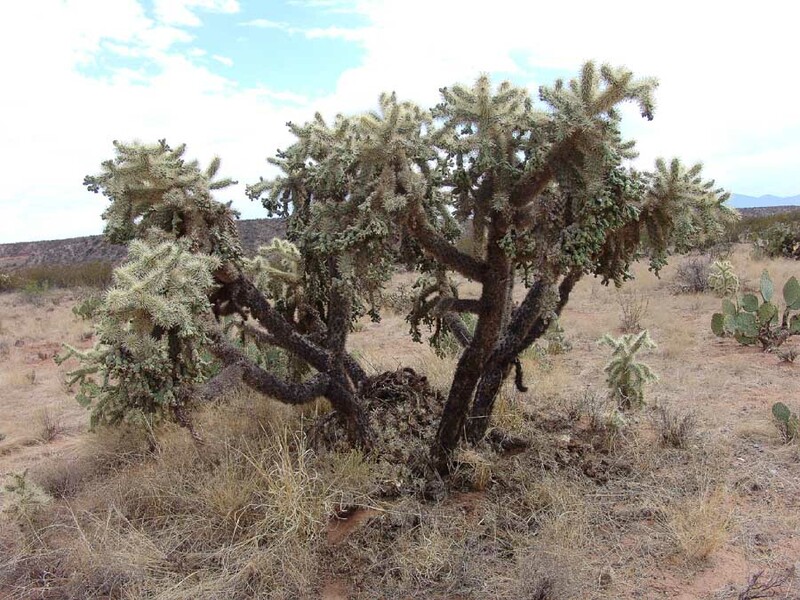 Indeed, this location would seem to be a kind of "Packrat Heaven", since the foodstuffs the packrat prefers to eat are the stems of these very cholla plants, the consumption of which enables them to live entirely without drinking free water should that be required. 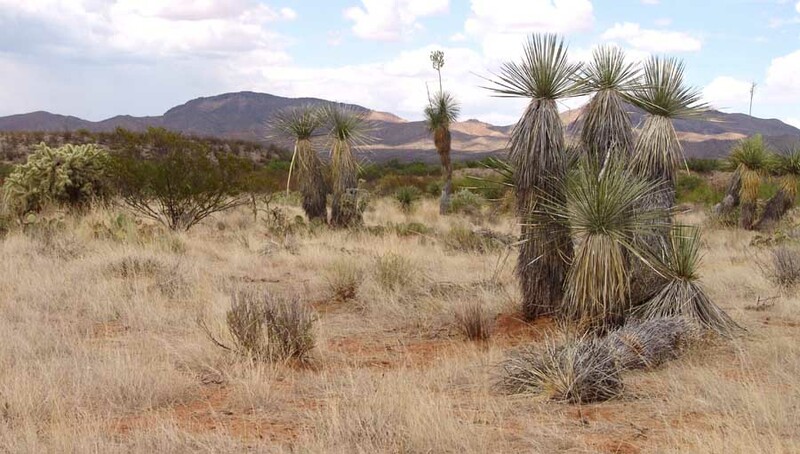 Now approaching the Grand Roadway on its northern side, we encounter an array of Yucca elata, a characteristic shrub of this ecozone. Below, a group stands in silent contemplation of their presumptive ancestor, the taller one in the background at mid-photo and the only one of this family to bloom this year. Note also the fairly dense stands of grass on these terraces (also evident in other images above). 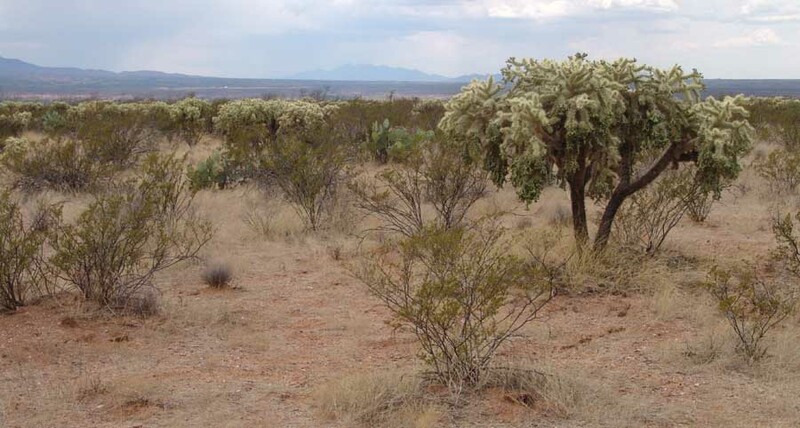 These reflect the relevance to this area of of the ecoregion called Apache Highlands Grasslands (and see also The Nature Conservancy's Apache Highlands). 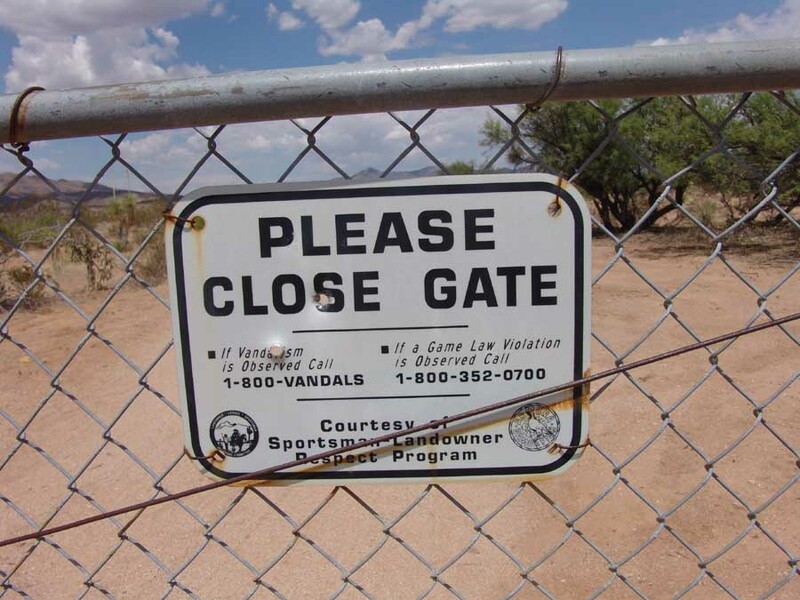 This desert grassland location is definitely frequented by hunters and target-shooters. We heard gunfire as we began this side-trip while driving up the road just beyond the southern tip of the Grand Cut. Out on the road again, we look southward, noting the northernmost Cut is one-sided, the terrace we have just driven on being lower than the higher, older terraces flanking the roadway here. We should say that the Grand Roadway does provide grand vistas as well as much shortening of the route at this point. For example, in this image below, taken in February 2004, the Grand Cut frames a very long north-looking view of the valley all the way past Kielberg Peak at far left-center. It is quite a startling panorama of this basin/range land.